Here is my newest set of variants called Bristly Dabs. 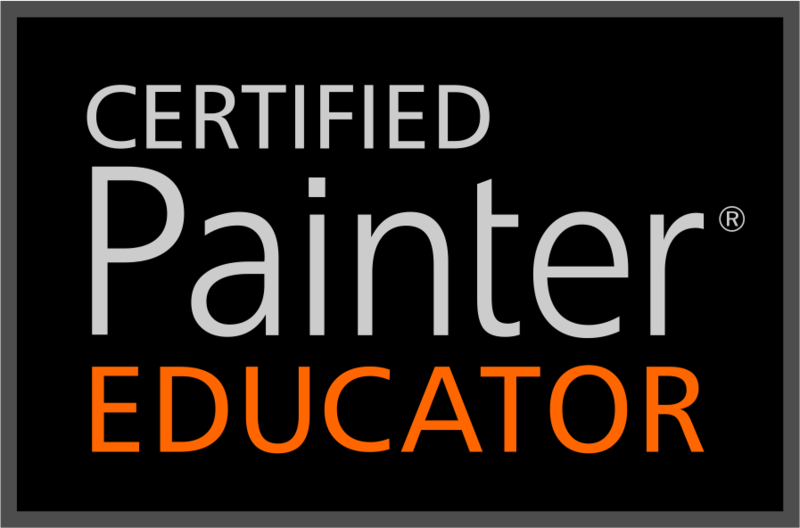 Thanks to David Gell, Master of all things Painter,made the sets backward compatible to Painter IX. You will notice that two sets are available for download. One called PIX_Bristly_Dabs.zip doesn’t use the expression rotation. The other set called PIX_Bristly_Dabs_Rtn.zip uses the expression rotation with several variant. Use them with the Art Pens for the Wacom Intuos 3, 4 or Cintiqs. If you have an art pen, do download the zip file with Rtn in its name. In Painter 12, not necessary in earlier versions, go to Window > Brush Control Panel > Well and make sure to check Brush Loading. Brushes are extremely pressure sensitive. They are working with my global Brush Tracking settings and in some cases I set Brush Calibration to achieve the look I wanted. You will need to tweak Brush Calibration for the way you paint. These variants will blend sort of like Artist’s Oils, but they are Captured Dabs, which cannot use the Artist’s Oils control panel. Light pressure helps with blending. If you pick up the brush, you will apply the main color again. Please look at the post about Bristly Dabs for more complete information. Now that we have Painter 12.1, I have added two downloads that will load automatically into Painter 12.1 and above. Please see the page about Brush Management for Painter 12.1 for instructions. One download will load a library with the brushes, the other will load a category into the library of your choice. Glad you came by…yep Tim and his site TAQ are the best. Glad you like the look of the brushes. I hope you do try them out. Thank you so much. I value your opinion and love your work. I can’t wait for you to try them. I enjoying watching Tim, too. Hope you have a fun time on your trip. I just tried them Skip and truly LOVE them. I did a quick trial run that I posted on PT and TAQ. These are my favorites of yours. Thank you so much for your comment. I adore your work. Your color sense is amazing and I love the way you handle any variant. You exemplify that it isn’t the brush but the artist using the brush that makes a difference. I am so excited that you like these variants. I find your work inspiring and enlightening. I do not have a great deal of experience with painting or drawing and every tip or brushes etc you have created has been very helpful. I am very interested in trying to paint with thick strokes similar to leonid afremov-style. Even though Painter 12 is amazing since earlier versions (I have it since 9th version) I am still confounded with trying to replicate that style. Please continue in your efforts. Thank you very much for you comment and thanks for stopping by. Your question is a pretty tough one. Mr. Afremov paints with a palette knife and Painter does have palette knives, and while they are good, I haven’t been able to use them the way I would like. I made a set of brushes called Skip’s Thick Paint and a few of those come close to doing what I want and something similar to Afremov’s work. Hope the tip is helpful. Good luck and let me know how you progress. Wow, thank you Skip for replying so quickly and thank you for the content. I will try these and let you know. I am confident that Painter will develop some simpler way to deal with this issue in the future but until it does please don’t forget to include tips and tricks in the near future! I’m a photographer and am new to Corel Painter12. It’s been a huge learning curve for me but your tutorials and downloads have been invaluable. I just wanted to say thanks so much! I appreciate the comment more than you know. You are keeping me motivated to post. A lot of photographers use Painter…it is a great blend of tools. Add to it Photoshop, which I am sure you have and your tools are very powerful. Skip, can I ask one more question? Can these brushes be used as cloner brushes so I can pick up the color of an underlying photograph? I tried moving the resaturation slider down to 0% and also clicked on the Clone Color icon but neither did the trick. I’d love to get the thick paint effect that your brushes offer but had hoped to pick up the colors in my photos. Thanks again for any help you can offer. Yes they can be used as clone brushes, but there is more to it than having an underlying photograph. If you want to use the underlying photograph, then set the layer to pick up underlying color, but that isn’t cloning. To clone open your photograph and go to File > Quick Clone, which will open an new document is your target for the clone. It is a rather complex subject. If you will go here https://skipallenpaints.com/2011/05/ you will find a video on cloning. I have several, but start with this one, which describes the process in Painter 12. Once you set up a clone source and target, then the brushes can clone. Thank you so very much, again! You are most welcome. I am happy to help. Thanks so much for these wonderful brushes. I downloaded them this evening, and my partner and I spent several hours playing with them and we had an absolute ball. We love the look of heavy, thick oils that they let us achieve. However we were wondering if you cover, in a future blog post or webinar, how to use the palette knives in Painter 12 to get that thick slab of paint that is seen so often in traditional oil painting? We would really appreciate the help, as we simply cannot figure them out. I understand…palette knives are a bit hard to handle. Try going to Angle and change the Expression to Tilt, Bearing, or if you have an Art Pen try rotation. That will help with moving the knife around. I will try and do something with them soon. Thanks for the great brushes, your blog is a terrific resource! I imported your Bristly Dabs category into Painter 12.2 and have had fun playing with them. I particularly liked SA Impasto 5-M-N, but while messing around I selected the “circular” dab type and discovered I couldn’t go back to the captured mode. Painter gave this message: “You must first capture a brush before this brush can be built”. The brush remains circular even though ‘Captured’ is selected. I tried deleting and then re-importing a fresh download of Bristly Dabs, but no dice. Unfortunately Painter isn’t allowing the original brush to work correctly. Thoughts? This is a mystery…especially about the re-import. 1. When you first tried to go back to the captured dab, how did you do that? Did you go to General and change the Dab to Captured and you got the error message? Or, did you click on the reset button on the far left of the property bar? I think you may have gotten the dab back if you had hit reset, but sometimes that doesn’t work either. 2. OK, so you re-imported and nothing changed. That’s the really strange one. Did you remove the first import prior to the second import? If not, the second import will come in with a number 1 added to it to identify that it is a different import from the original import. It will not over write it. If you didn’t see this second file, then the import didn’t work. If you are using that Bristly Dab.brushcategory, the category will be imported into your currently active brush library, which means that you probably have the second imported category in one of your brush libraries…check them all out. If you cannot find it, here is what I would do. 1. Remove the Bristly Dabs Category. 2. Re-import the category into the same brush library and check to see if it worked. 3. If it didn’t, remove the category again and re-download the category. Maybe something got corrupted and you need a fresh download. If that didn’t work, I will be glad to have a live session with you and take a look at what is happening. You are welcome. Hey, thanks for letting me know the unique pronunciation of your name. I love it. I am watching a video you made some time back. (All your videos are beneficial, even the old ones. :) ) This is where you created a rose with the video, Impasto – 3. I have your Bristly Dab brush category but there is no palette knives in it, to make the rose. Do you have advice on how I could get these or make them myself? I did make the raw set available when someone asked about it on Painter Factory. Here is the link. Globs of Paint Please remember these are a raw set and haven’t been finalized…not sure they ever will. Thank you so much….you are so helpful. Stay just the way you are. I just checked all the links you mentioned and they are working fine. I’m not sure why you might be having trouble. Were you able to download any of the brushes? Cheers for the super quick reply! I have downloaded all of the others that you have except the above ones. It takes me to the download page, but when i click “download” it times out saying file not located. With all the others i did the exact same thing and they downloaded fine. Also, tried in Google Chrome and Internet Explorer with same thing happening so definitely not browser related. Well it is odd. At first I got the download page and clicked on the download and was given a window that allows me to save the download…so it appeared to be working. I went back and tried again and got the same error message that you got…link timed out. So, I have just spent a period of time with their tech support who suggested that I send another link, which upset me greatly. He said the link is working, but it must be a net work issue or speed issue. When testing my speed, I am getting 124 MB per second download and around 30 MB upload. He suggested I try their speed test, which only goes to 50 MB per second and on their speed test I got 53 MB per second…over what their rating was. Anyway, bottom line. I can’t do anything about it now. I will start looking for a new home for my links tomorrow. Their support is ridiculous. I’m thinking that tomorrow, you may be able to get in and download the items. Please try. I am sorry this has happened and I will try to fix as soon as I can. No need to be so apologetic Skip. You’re the one openly sharing your hard work so I’m more than happy to tolerate a few glitches to get the goods (glitches that aren’t your fault, I may add!). Thanks…I appreciate your patience. The thing that I am not sure about is whether a new link will help. They kept saying a glitch in the network…which has nothing to do with the link. I will have to do some research on my own. Thanks for letting me know about the issue. I just tried the same download and it goes into a forever spin of trying to download til foxfire post a time out expired page. Just thought you would like to know. Thanks for your efforts Skip….you are great. Hi Linda, I’m still getting the forever spin, too. Hightail asked for a lot of information and then told me the links were working and to send a screen shot of the time out screen, which I have done. It obviously is something at their end since not all links have the problem. If there is something wrong with the link it happened on their site because the files are stored there. I am really disappointed with the response of their support. Until I got really pushy they basically told me it was up to me to fix it. At least now they are looking into the problem, but the end result may be that I need to move to another site. Again, I’m sorry for the problems folks are having. Thanks for letting me know. Any luck with these yet? Or are you able to upload to another hosting site at all? Hightail finally started trying to fix the problems although they have been working on it for 8 days now. I have been trying to wait it out hoping I wouldn’t have to move to another site and redo everything. The last communication from them was today responding to request for status on my request for help. I think they are at least admitting the problem is on their end, but I have to admit I am shocked it has taken this long and still no real answers. I seem to be having trouble all around. I updated my Surface Pro 3 to windows 10 without a hitch. But my desktop is giving me fits. I spent 2 hours yesterday with Microsoft Help trying to fix the problem and another two hours today. Still no fix. So I have an appointment to meet with one of their software engineers tomorrow…who-hoo! Actually, they have been very nice and I can tell that the two techs I have spoken with really tried their best. Hopefully the next tier of support will be able to resolve the problem. Anyway…back to you…I’m hoping we will be back in business by the first of next week…I hope. Skip, the brushes links are going to some GoDaddy domain expiration, have you tried them recently? Hi Duane, They should be working now. I just talked with the site manager and I tried splashing water library and it worked fine. Can you tell me which one you tried and will you try it again. Hopefully they are working. Sorry…I didn’t see that you were posting from Bristly Dabs Download. Let me try it. Duane, it is working for me. You should have a window open that asks you if you want to save the file or open it. You would want to click on save and save it somewhere on your hard drive to install in Painter. Let me know if it isn’t working for you. Hi Skip, I love your style and your tutorials, just one question. No, sorry I do not have a tutorial for that…I will show something similar in my class that starts on July 8th.